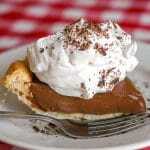 Chocolate Silk Pie, a real old fashioned recipe for a creamy chocolate custard pie topped with mounds of fresh vanilla whipped cream. 2 or 3 tbsp ice water Only enough to make a dough form. Start by preparing your pastry. Pour cold water over the mixture and work in by tossing with a fork until dough begins to form. Use your hands as little as possible and work the dough as little as possible. Flatten the dough into a 5 inch round, wrap in plastic wrap and place in the refrigerator to rest for a minimum of 20 minutes. You can make your dough the previous day but make sure you take it out of the fridge for 10 minutes to warm slightly before rolling out. Roll the dough into a 12 inch round and place in the bottom of a large 10 inch pie plate. You will need to blind bake this bottom crust before adding the filling. Blind baking is essential so that the bottom crust will not get soggy. Bake at 400 degrees for about 12 -15 minutes. Remove baking weights and parchment (or foil).Bake for an additional 5 minutes or until pie shell is light golden brown and completely baked. Scald the milk in the microwave or on the stovetop. Microwave works best as there is no chance of burning the milk. Meanwhile, in a saucepan combine the flour, sugar and salt. Over medium flame slowly add the scalded milk whisking constantly. Continue to cook over medium heat until mixture begins to slightly thicken. At this point remove from heat and pour about a half cup of this mixture onto 3 slightly beaten extra large egg yolks whisking constantly. Pour the egg mixture immediately back into the pot, continuing to constantly stir. Cook for an additional minute or two until pudding consistency and remove from the flame. Stir in the butter and vanilla extract. Cool slightly and pour into prepared baked pie shell. Cool to almost room temperature then chill thoroughly in the fridge for several hours or overnight. To prepare the vanilla whipped cream. Whip together the whipping cream, icing sugar and vanilla extract until soft peaks form. Spoon on top of pie and serve. Garnish with shaved chocolate.